Grace came with an odd pedestal guard which appeared to be factory installed. It was tiny, hard to hold onto when moving around the cockpit, and also it had started to come loose recently. 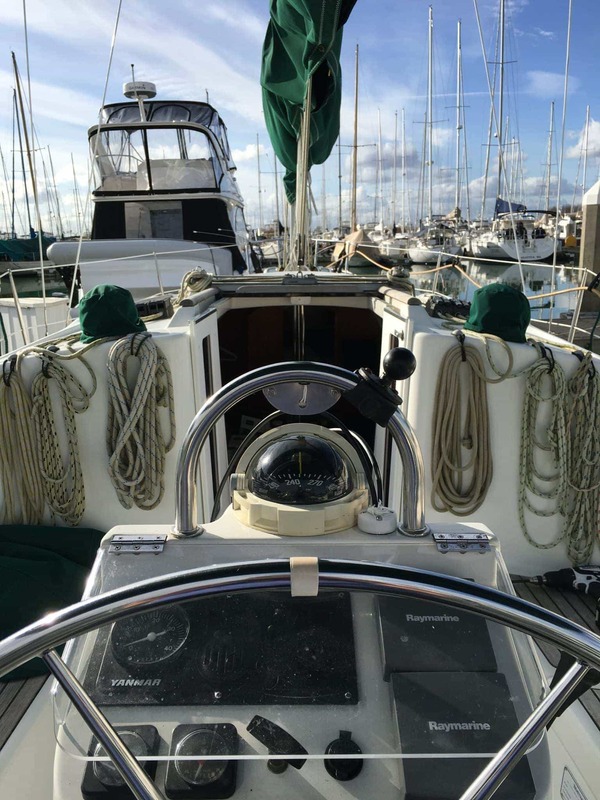 I started looking at options, and ended up posting a message in one of my favorite places for Beneteau owners – SailboatOwners Forums. Here’s the original pedestal guard, which was somewhat functional, but ever since I added a RAM mount to the top to hold my chartplotter, it became mostly unusable. After some back and forth on the forum, and with Reed @ Ocean Equipment (who was extremely helpful – nice in today’s world of impersonal online orders) I settled on a Single Bend AngleGuard which is 9.5″ wide, and 1.25″ diameter tubes, paired with a NavPod SystemPod that matched the guard. The first part of the install required removing the original guard, and then enlarging the holes. The width on the original one was wider than the new AngleGuard, but based on measurements, widening the holes would work out perfectly. The next step was cutting down the AngleGuard to the right depth, drilling some holes through the pedestal base, and adding clamps to keep it all secure. That required some seriously weird measuring – having the entire unit test installed, reaching up through an access hole with a light and a marker on a stick. I also wanted to replace a light that lit up the cockpit table – we play card games outside all of the time and needed good light. I ended up using my favorite LED source for an outdoor, warm, wide beam light, and an in-line dimmer. 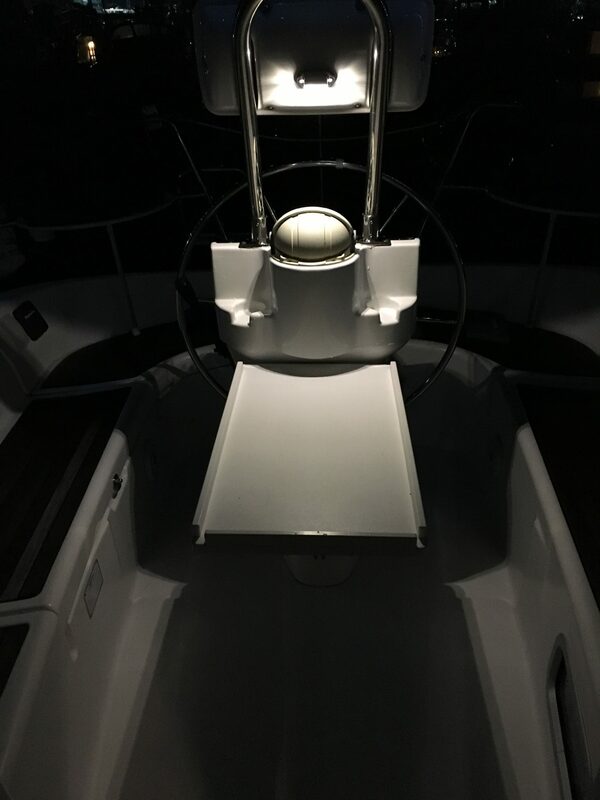 The light is absolutely perfect – a great warm color, wide beam angle, and dimmable via a nice little remote that can also control more of the in-line dimmers, which I intend on installing elsewhere in the cockpit and companionway. The base itself is secured deep inside the pedestal, but also at the top of the fiberglass structure with two pad mounts. 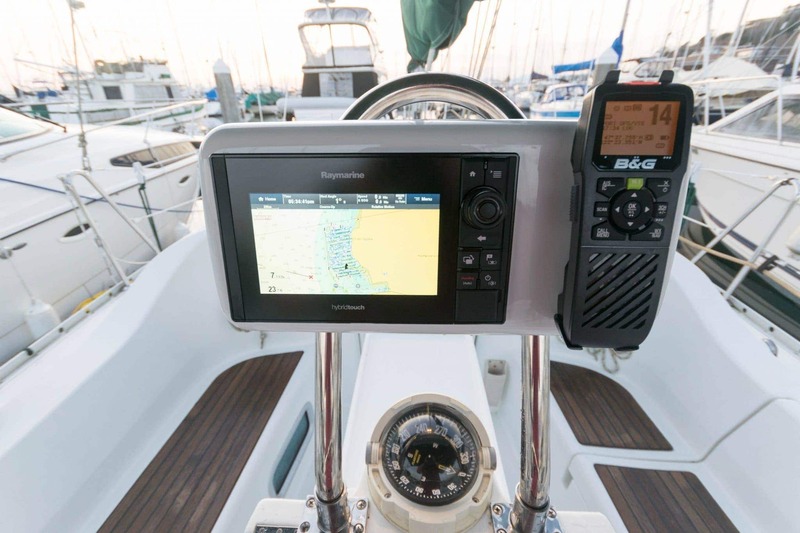 The rest of the install consisted of mounting the NavPod on the guard, wiring the LED light, running the cables up the guard (not an easy task) for both SeaTalkNG and power, and mounting both the Raymarine eS78 MFD and the B&G H50 wireless VHF handset. 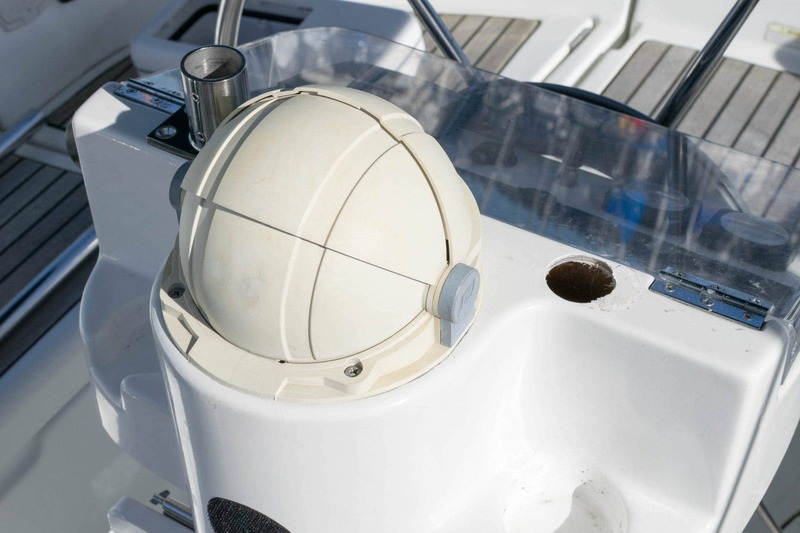 The NavPod was pre-cut for the Raymarine, but required holes for the H50 VHF. I also added a BlueSea power distribution strip inside the NavPod so I didn’t have to run multiple wires up the AngleGuard. The final product not only provides a fantastically strong guard to grab onto, but provides almost triple the grab space all around. Especially for me moving from the captain’s seat forward, it is perfect to keep things as safe as possible. On top of this, the MFD and VHF are front and center, viewable by standing or sitting, and not obstructing my view forward when sitting. The wireless VHF is fantastic – providing clear audio pointed right at the skipper, and available to walk around with if needed. I’m very happy with the overall result, and expect a long life out of all parts of this great install. Standard hatch boards on a Beneteau 311 are heavy and hard to use. I wanted something easier to open and close, and more useful when closed. Zarcor has a history of making doors for all makes of boats, and they worked for me too.